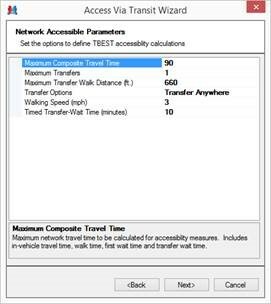 The TBEST Access via Transit Summary expands the TBEST measures of transit accessibility by providing the ability to access various activities via transit from a given area aggregated over the totality of geography. 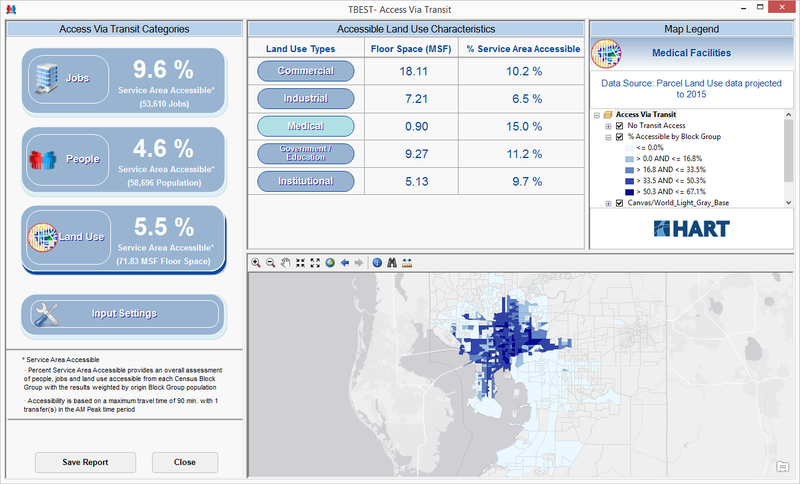 In the context of the TBEST Access via Transit toolset, Access via Transit is measured by averaging accessible jobs, people and land use between all stop pairs either at the system-level or by Census Block Group. The TBEST Access via Transit toolset is constructed to provide summary, system-level socio-economic characteristics based on user-specified networks, socio-economic conditions, walk parameters and networking parameters. The creation of an Access via Transit Analysis is guided by a wizard-driven interface which accepts input filters for walk distance, networking parameters such as maximum impedance (travel-time) and maximum transfers and an agency logo for display with the reporting results. 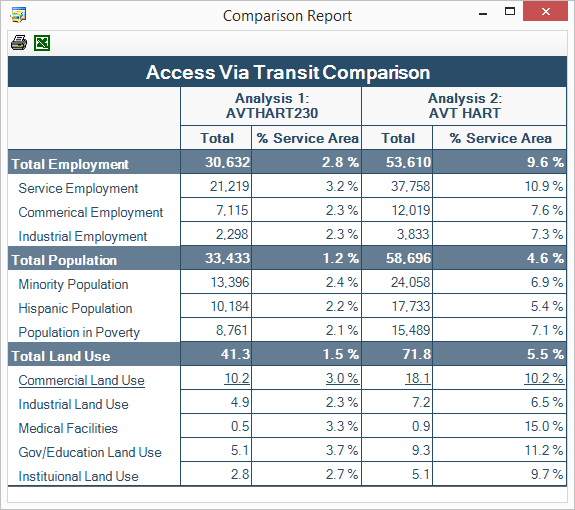 The Access via Transit analysis results are displayed in an interactive and easy-to-interpret Access via Transit Summary dashboard interface. The interactive dashboard Summary Bands allow users to quickly digest the intensity of network accessible population, employment, and land use relative to the service area totals. Detailed network accessible demographic information and map distributions are also available by clicking on a summary band or by clicking individual demographic summary buttons.